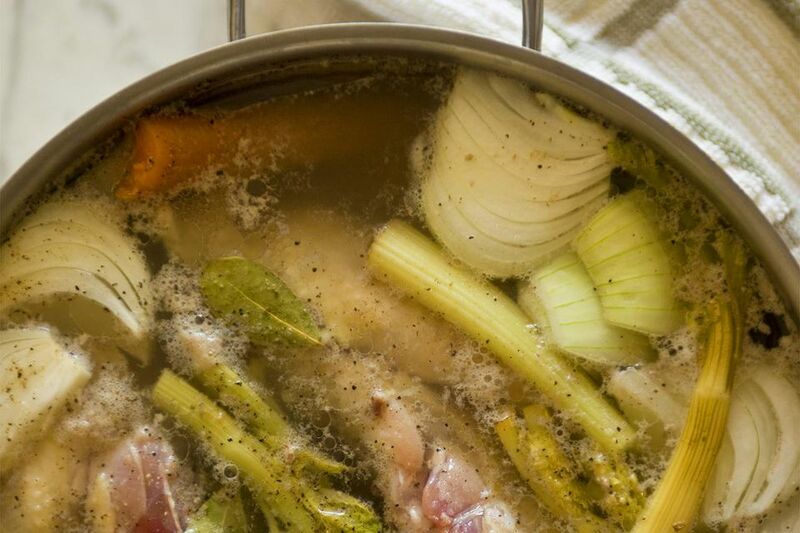 The neck, back, ribs and wings are excellent for making chicken stock. Best of all, however, are the feet. Always start with cold water. This helps extract more collagen, giving the stock more body. Don't let the stock boil. It should stay at a gentle simmer. Don't stir the stock as it simmers! All you need to do while it simmers is skim the scum off the top, and add water if it drops too low. Hang on, did that say "chicken feet"? Yes, it did. Chicken feet are full of rich chicken flavor, and they're practically 100 percent cartilage, which is made up of a protein called collagen, which when simmered breaks down into gelatin. This is what makes a good chicken stock jell when you refrigerate it. You can get chicken feet at the Asian supermarket, and there is literally no better way to make chicken stock than with chicken feet. You'll be glad you did. The only thing that even comes close to chicken feet in terms of being essential to making chicken stock is the Instant Pot. It's no exaggeration to say that the invention of the instant pot has made the traditional method of making chicken stock obsolete. With the Instant Pot, you simply add your chicken feet, water, aromatics, vegetables and so on, set it to "bone broth" and walk away. Another advantage of the Instant Pot is that because it cooks using pressure, there is no bubbling or agitating happening, and there is certainly no way to stir the pot while it cooks, which is good because stirring the pot is one of the biggest mistakes home cooks make when making stock. Stirring agitates the proteins and causes the finished stock to turn out cloudy. Stock made in an Instant Pot, on the other hand, sits perfectly still throughout the cooking process, and thus turns out marvelously clear. Of course, if you don't have an Instant Pot, the technique below will work. After all, it's been working for centuries. Tie the thyme, peppercorns, clove, parsley stems and bay leaf into a piece of cheesecloth. Rinse chicken bones in cold water and transfer to a heavy-bottomed stockpot. Add enough cold water to the pot to completely cover the bones — about 5 quarts. Bring the pot to a boil, then immediately drain and rinse bones. Return the blanched bones to the pot and again cover with fresh, cold water. Bring the pot to a boil, then lower the heat to a simmer. Skim off the scum that rises to the surface. Add chopped carrots, celery, and onion, (also called mirepoix) to the pot along with the sachet; tie the sachet string to the stockpot handle for easy retrieval later. Simmer for about 4 hours, continuing to skim the impurities that rise to the surface. The liquid will evaporate, so make sure there's always enough water to cover the bones. After 4 hours, remove from the heat and strain the stock through a sieve lined with a few layers of cheesecloth. Cool the stock quickly, using an ice bath if necessary, and then refrigerate or freeze. Note: For an illustration of a sachet, see this glossary entry on the sachet d'epices.